You want hair extensions and you feel confident that you can save the money and do it yourself, but you want to make sure that they look natural. These tips will help ensure that you are on the right track. Don’t install on hair that is shorter than the occipital bone (the jaw, or shorter). If the intention is to add length you are going to end up with a bad hair extension job, simply because it’s very difficult to blend extensions into super short hair. If you just can’t wait till your hair grows out, then you can add extensions but they should not be any longer than twice the length of your natural hair. The idea behind the Golden Rule is that if a client is going from a short do to a long hair look it’s a transition that really can’t be disguised well. So if your hair is just touching your jawline, don’t use extensions longer than shoulder length. 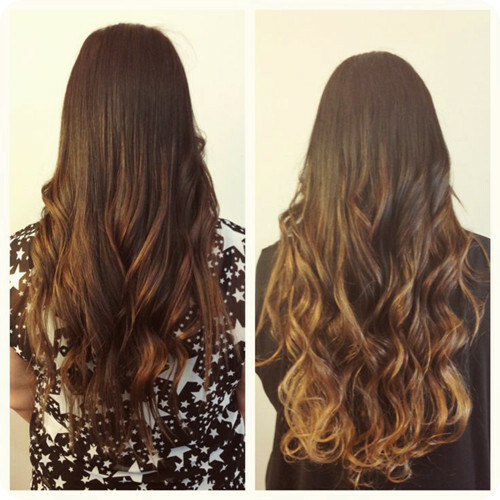 The idea of installing hair extensions is to make them look as natural as possible, after all! There are plenty of color options so it shouldn’t be too difficult for you to get it right, but don’t stray beyond two shades of your original hair color. That is not your root color, it’s the shade of the end of your hair as that’s what the hair extensions blend into. Hair extensions generally have a lifespan of around 6 months, but don’t install, remove and reinstall them more than three times. They start to lose their sheen after a while and in turn that means they lose their natural luster. Clip in extensions are actually really easy to work with and they’re a great way to add length instantly. If you’re not looking to add length but your aim is fullness, then they provide you with ease of use. Some top tips are: don’t sleep with your clip in extensions on. They’re not meant to daily use, either, so they don’t need washed all that regularly. Because you’re clipping them in it can weaken the hair in that area so make sure that you don’t clip them in the same area every time. This is the option for a person who is looking for a longer-lasting lengthy look. Each panel is attached using double sided tape, it can take about an hour to get done. They are a bit pricier than other options, but you get what you pay for and what you’re paying for is a look that is incredibly natural and stylish. The tape in will last you about a month, and you can wash and condition as you normally would. You can even blow dry it. With sew in hair extensions you are no longer bound by length, color, volume or texture. Unless you have a friend who is really skilled in hair it’s likely you’ll need a stylist for sew in extensions. You need to create flat cornrows all over your head so that the sew in can be weaved into the braids for support. It can take as long as 5 hours but it lasts around 12 weeks so it’s cost efficient. Extra bonus is that your hair is getting a break from straighteners and hairdryers. It also means the entirety of your hair is made up of this sew in hair extension so it’s consistent. While that sew in lasts around 12 weeks you can have it re-sewn in for at least a year. You just wash and shampoo as normal.